Access control for visitor parking & crew vehicles, easily identify staff, visitors and VIPs with customized vehicle passes, available as hanging mirror hooks, cling-on window stickers and tamper-proof designs. Show me prices for units? Use ID&C's custom parking passes and vehicle credentials to securely manage access to your event site. Chose from a range of custom card and self-adhesive passes, stickers and hang tags to identify cars, bikes, trucks and plant machinery. Utilising our variable data and custom security print options, fake passes and fraudulent vehicle access will be a thing of the past. Save money, make money and secure your event, venue or facility with our secure vehicle passes. We have a huge range of custom wristbands for events, all of which can be designed to your requirements. We produce most of our wristbands and passes in the USA, allowing for fast production and quick delivery to your event. 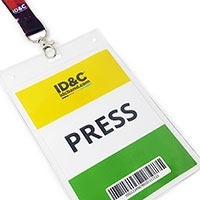 promotions and exclusive discounts from ID&C!